Homepage Knowledge Centre Blogs What are the benefits of social spaces? What are the benefits of social spaces? The way we work today is more social than ever. 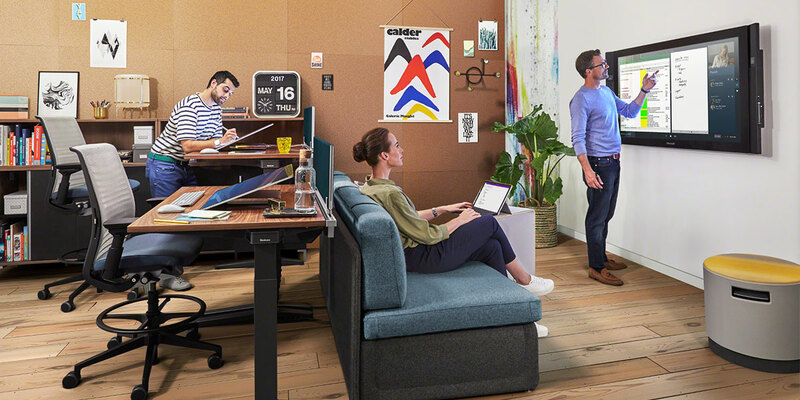 Gone are the days of uniform rows of desks and office chairs to make way for more flexible and inspiring spaces, to encourage social interaction and collaboration. Advancements in technology have automated many ‘process’ driven tasks and roles, so there is now much higher value placed on creativity and innovation – as ultimately these are the things that will give a company a competitive edge and improve the bottom line. 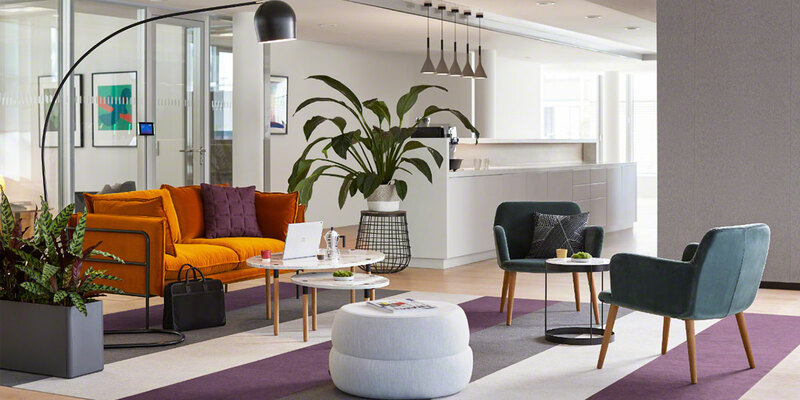 Whether you call it a breakout space, canteen, WorkCafé or ‘third’ space – social spaces are now seen as an essential for a modern collaborative workplace. The increase in mobile technology allows people to work anywhere, resulting in an increase in flexible working, with a rise in people working from home or an alternative place like a café. Whilst this gives workers more freedom and control over how they work, it doesn’t bring employees together to connect, collaborate and share ideas. 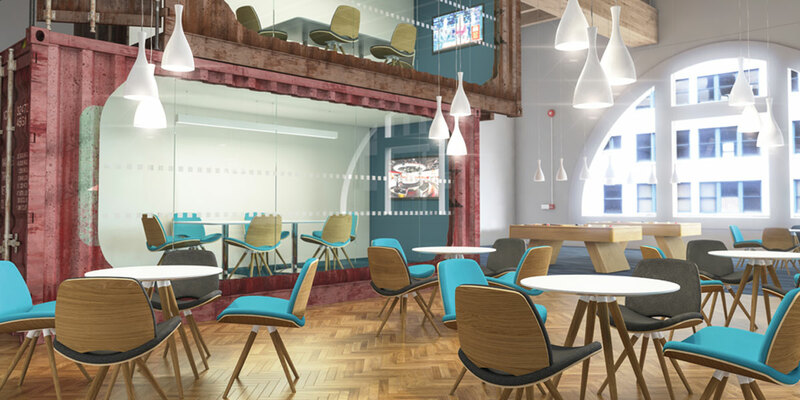 By investing in a social space such as a WorkCafé, employees can enjoy the social buzz and atmosphere of the ‘café culture’, whilst connecting with colleagues and increasing opportunities to build relationships and share ideas in a relaxed environment. The best ideas are often generated in a relaxed atmosphere over a drink, where people can be themselves and feel comfortable to share their thoughts and opinions openly. Interior design trends from the home have crossed over into the workplace, where you’ll now see more comfy seating and sofas, rugs, lamps and accessories to create a relaxed social atmosphere – where people can take time out, work on quiet concentrated work, or a have quick catch up meeting. If you need re-energising, there’s nothing better than a bit of friendly competition to increase your energy and alertness. Within our WorkCafé, we’ve incorporated a meeting table that doubles as a table-tennis table for those moments where energy levels need a bit of a boost! Like the kitchen is often the hub of the home, a social space or ‘WorkCafé’ is the social hub of an office. The positive effect social interactions can have on employees wellbeing shouldn’t be underestimated. Connecting with colleagues creates a sense of belonging and helps people identify with the company culture, which goes a long way to engaging and retaining loyal employees. A social space is a perfect place to display company information, updates and news – keeping everyone informed and reinforcing the company brand – digital displays are increasingly popular as they are instantly updatable and visually more engaging than a noticeboard! A social space provides a shared space for employees from different departments, divisions and levels of a business to come together on an equal ground. By breaking down divisional or hierarchical barriers you can increase the opportunities to share skills, knowledge and experience across different departments and within the workplace. The non-hierarchical feel of a social space creates a more informal friendly meeting environment. The boardroom has a certain stigma attached to it, and breaking away from a formal setting can create a relaxed and creative mindset. In more recent years, there has been a rise in popularity of co-working spaces. These are multi-purpose spaces that apply the principles of a social or collaborative workspace to create a communal facility that gives added value for occupants of a shared building. An additional benefit from a co-working space comes from the ability to connect with like-minded individuals and businesses within a communal space. A sense of community is often built through hosting social and business events, which can inspire creativity and an entrepreneurial spirit. A typical co-working space would provide a kitchen area, a lounge area, meeting space or booths offering varying levels of privacy, hot desking areas and will ideally cater for additional work needs in terms of technology, ergonomic and wellbeing needs of workers. 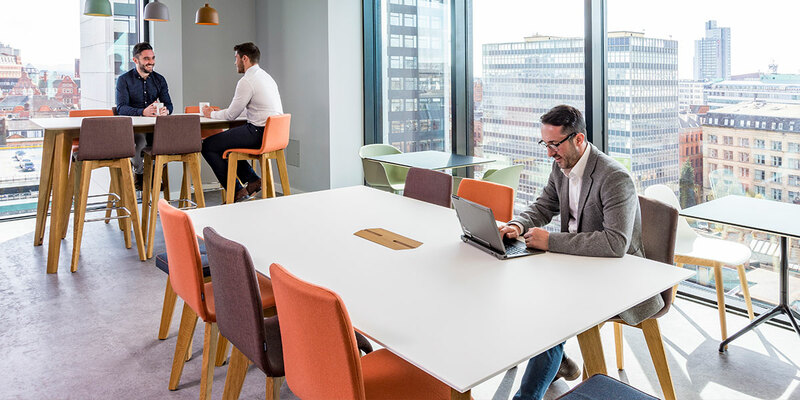 We recently worked with Bridge Architects to create innovative, forward-thinking spaces for meetings and co-working as a communal facility for occupants in Bruntwood’s Neo Building – view our case study and images here to find out more. If you would like to discuss how a social space could be integrated into your workplace or would like some inspiration and ideas, contact us using the details below.